The Dam Committee is a standing Committee of the SWLA Board of Directors (BOD) and is responsible for the maintenance, protection, and preservation of the Lake Auman dam, in its roles as (1) a high hazard dam (regulated by NCDENR dam safety law of 1967 and subsequent amendments) discharging to Willow Creek, and (2) as an amenity of value to the SLW community. Please refer to the Dam Committee page for its periodic detailed reports about the dam infrastructure and maintenance. The Lake Committee is a standing Committee of the SWLA Board of Directors (BOD) and oversees the operation and maintenance of Lake Auman and community Ponds. The Committee consists of between 5 to 10 association members in good standing that an interest in the safety and security of the registered members and guests who use Lake Auman for boating, fishing, swimming, and other recreational activities. Please refer to the Lake Committee page for contributed articles about lake Rules and Regulations, fishing and boating guidelines, water quality and water safety issues. The Lake Auman Sports Club (LASC) contributes many lake enhancements such as stocking our lake with fish, providing fish feeder stations around the lake, and running the volunteer Lake Patrol on weekends during the summer. Please visit the LASC page. There have been several presentations and publications of information on the origins and stages of Lake Auman development. We are all familiar with the final product of a beautiful, clear, clean, and deep lake. But what lurks under the surface been a mystery to the entire community, including boaters and fisherman. Talk to a fisherman with a fish finder and they can tell you about specific fishing spots, but a lot of the lake bottom remained undefined. Not anymore. 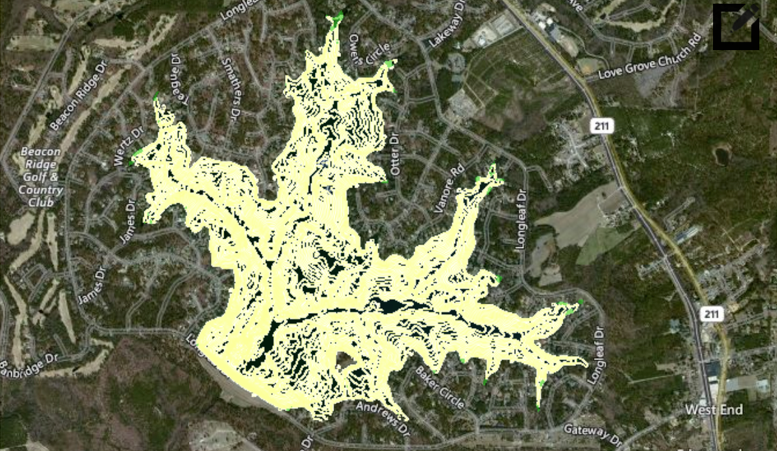 As an independent project for the Lake Auman Sports Club, Jim Pierman, in 2016 used a new "Lowrance" sonar-GPS system to record soundings from the bottom and uploaded the data to "Lowrance" proprietary software to develop three maps of Lake Auman. It took over 25 hours of crisscrossing the lake at approximately 50 yd intervals and traveling no faster than 8 mph to accumulate the data base. The fish finder recorded two frequencies of sonar and the GPS location for each data point with the frequency of how often it pinged, varying with depth. 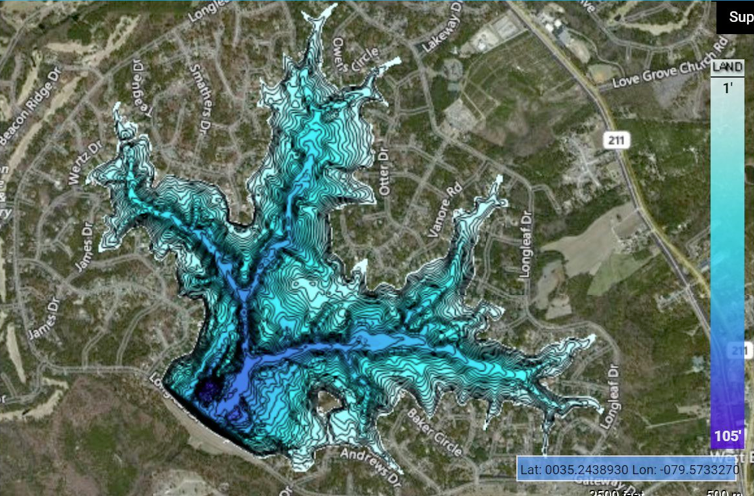 The "Lowrance" software stitches together the individual data points to form the three maps with small areas of missing data filled-in by interpolating the contour lines. The maps were then posted on a restricted member website for review and publication. The three maps are contour, bottom hardness, and vegetation cover (green areas) as seen below. 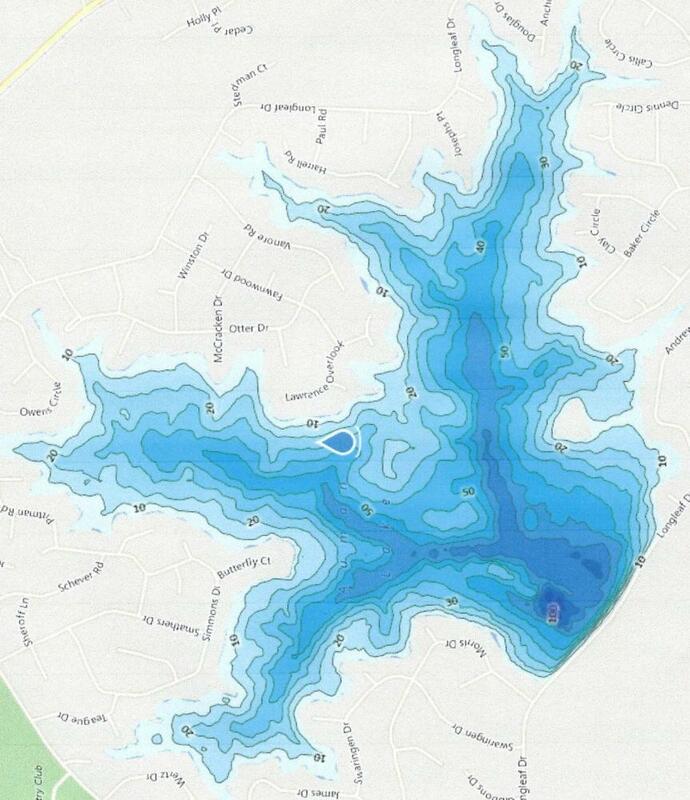 Accessing the map on the web will allow you to zoom in on any area and see much more detail. 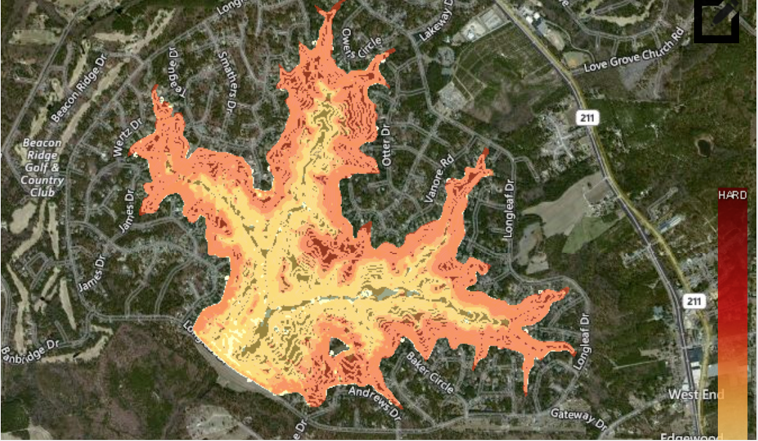 The contour map is in three-foot line intervals, because the lake is so deep. One foot lines would be too confusing. By using the instruction sheet you can download the contour map to any compatible "Lowrance" Chartplotter (fish finder w/GPS) and you can also see the thousands of lakes that have been mapped in the USA and all over the world. There are even two lakes from Seven Lakes North that have been mapped and published with many more Moore County lakes listed! For those of you who would like to thank "Lowrance" for this service, please remember that they have proprietary map access to all these lakes for free and that the maps only work with "Lowrance" equipment. Makes cents and sense! The water quality of Lake Auman has always been pristine and continues to be that way. No measurable degradation of water quality has been detected since the lake was nearly full back in 1991. 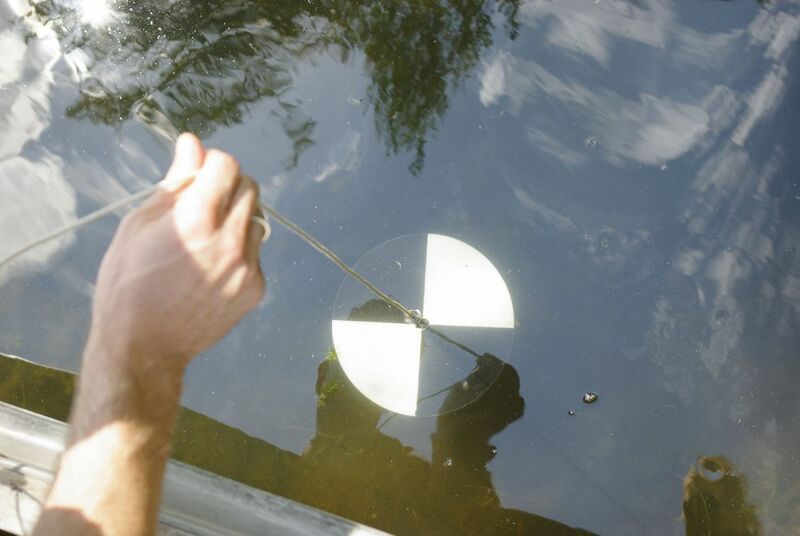 What in the world is a Secchi Disk?